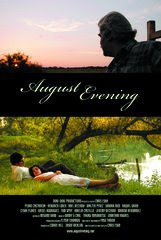 Three years before the film earned the John Cassavetes Independent Spirit Award, writer/director/editor Chris Eska made his feature length debut with the production of August Evening back in 2005. Filmed in South Texas by the cinematographer Yasu Tanida who, instead of a resume, could simply submit this quietly hypnotic and breathtakingly beautiful film to any future job interview, Eska’s contemplative Malick and Ozu inspired drama centers on the relationship between Jamie (Spirit Award nominee Pedro Castaneda) an undocumented farm worker well into his nineties and Lupe, his young, fiercely loyal and long-widowed lovely daughter-in-law (played by newcomer Veronica Loren). After Jamie’s beloved wife Maria dies just before her birthday and he’s soon forced into “retirement” from his undocumented labor intensive farm work, he and Lupe, who, preferring to look after Jamie, adamantly refuses any discussion she should marry another and move on with her life, venture out to stay with Jamie’s children while they look for work. The stark contrast between their simple life and the overly chaotic and varyingly self-involved lives of his two very different and grown children is noticed at once when they arrive at Victor’s home where, having suffered the brunt of a slowing economy in his job setting up LAN lines for companies, struggles to make ends meet for himself, his bitter wife and two rebellious sons. Seeking to extend hospitality, the proud Victor (Abel Becerra) borrows money and treats everyone to dinner where he and his wife take it upon themselves to try their hand at matchmaking Lupe with their hardworking butcher neighbor Luis (Walter Perez). While Luis is at once taken with Lupe’s beauty, she repeatedly resists his advances but begins to have a change of heart shortly before she and Jamie move onto stay with Jamie’s wealthy, yuppie daughter (Sandra Rios). Rios, who has an unshakable icy emotional exterior, makes the most of a few choice lines that seem to hint at some past domestic drama that existed in her upbringing which may have, with more explanation, assisted in viewer sympathy for her overwhelmingly unlikable character. Yet, the film, much to its credit, doesn’t settle for easy answers nor are there any big confrontational moments that bog it down into the realm of melodrama. Instead, it unfolds lazily (almost exceedingly so in desperate need of possibly a twenty minute cut from its 120 plus minute running time) like a warm, hazy, August evening. Featuring tremendous performances by the subtle leads Castaneda and Loren, for those with the patience and willingness to get (as producer Jason Wehling noted at its screening at the Phoenix Film Festival), "lost in" August Evening, you’ll find it is well worth the emotional investment.